When you children go upstairs you mostly feel it dangerous as they are just unstoppable when are in naughty mood. If you make them safe from the injuries due to their unexpected movements upstairs then to block them off downstairs will be a nice idea. 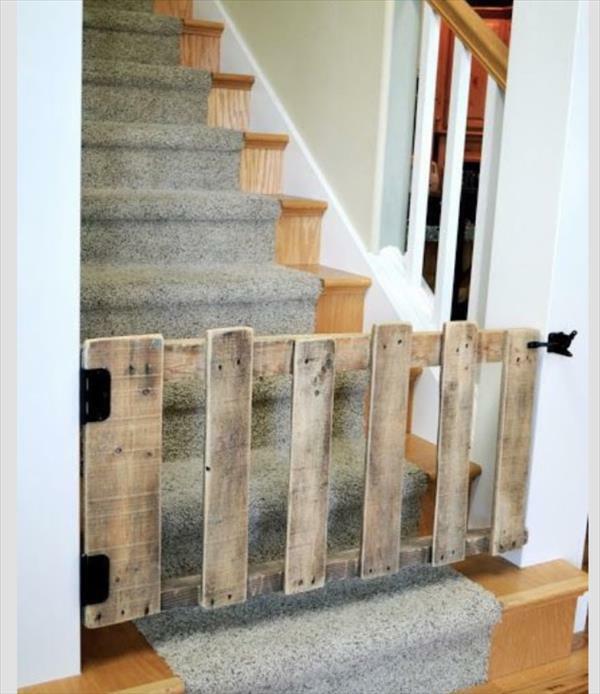 You can use this DIY pallet baby gate idea to make them stopped and unable to access the stairs. This smart use of pallet wood is multifunctional as you can apply this idea to your garden fences, home decks and everywhere where you want to block some unexpected entries of your kids and pets. The gate has been enabled to spin around the hinges and can be locked using the antique litch lock with the wall. This DIY pallet project is just great to make your kids protected and can also be done on much low-tariff budget. Do give this DIY pallet furniture a try as it is much easy, feasible and free of cost plan to block off you babies and pet down the stairs.